Remember this post? I thought, " oh yeah, right ". 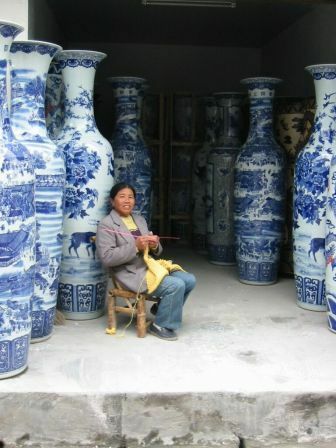 Chinese soldier vases. Who knew? I thought about for a few days, and then it came to me. done, I'll be sure to share it with you! Have you come across anything special lately? Did you find this at our Home Goods...I saw it there and thought wow! I cant wait to see what your going to do with it! YES! I did! Can you believe it? I also found a new exciting place for you to visit too. I'll send you an email with the info.I just placed it in the patio and it looks great. I'm so happy I got it. Stunning! I would love to have such a gorgeous statement piece!